Knowledge of the viscosity, especially in case of liquids is of great importance for selecting the right operating conditions in process synthesis. Numerous customers have inquired about experimental data and estimation methods in the past. DDBST therefore has started to build up a data bank for mixture viscosities and is proud to present the first version as part of DDB 2010. 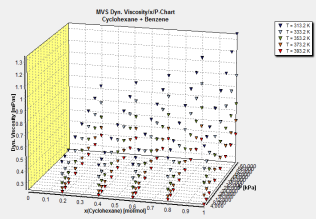 The DDB online search system shows the current number of sets, points, and systems: Mixture Viscosity Overview. Concerning price and license options, please email to inquiry@ddbst.com.